How could Chocolate Covered Peanut Butter Pretzels be bad? Answer: Not possible. 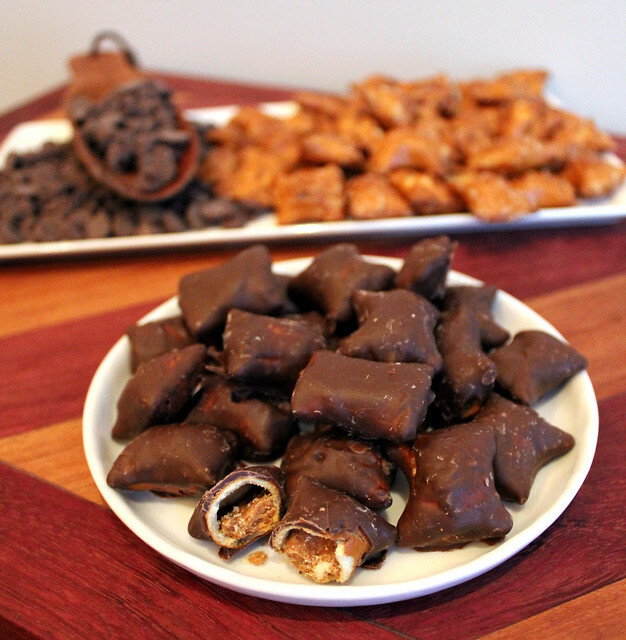 A few years ago I participated in a cookie exchange and had the brilliant idea to make chocolate covered peanut butter and caramel pretzels. Basically I spread a little peanut butter and melted caramel on pretzel twists and then dipped the whole thing in chocolate. Holy mess. They tasted great (how could they not?) but it was not worth the time and mess. Fast forward a few years and I came up with this version. 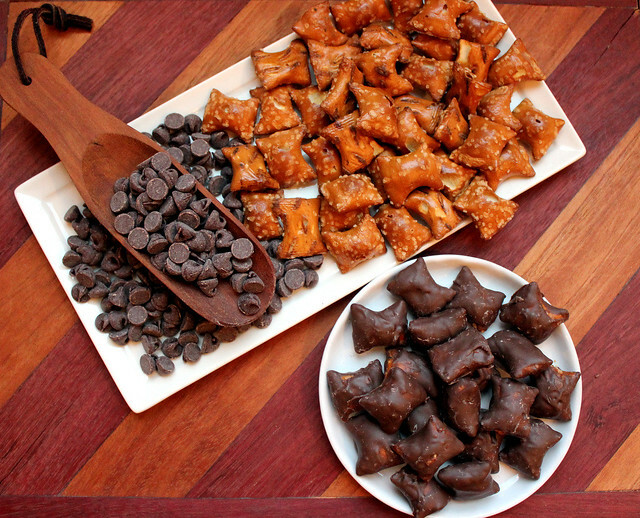 The store bought peanut butter pretzel nuggets make this process so easy. My mom and I made these over the Thanksgiving weekend to have for parties and gifts throughout the holiday season. They keep really well in the freezer so they can be made well in advance. 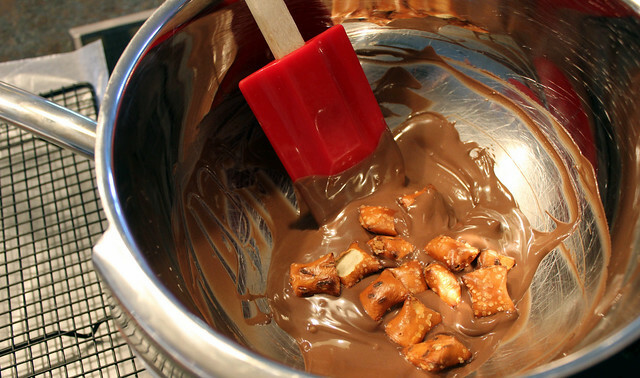 I melted the chocolate in a double boiler (metal or glass bowl over simmering water). I used chocolate almond bark and added about a teaspoon of shortening (1 tsp for every 6 oz of almond bark) to thin it out a little bit. 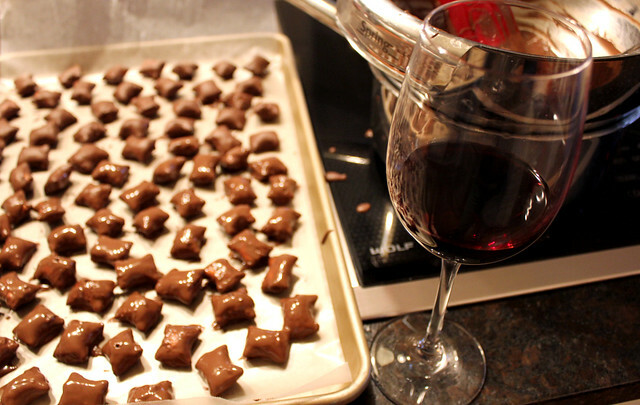 You could also use semi sweet chocolate chips or dark chocolate. 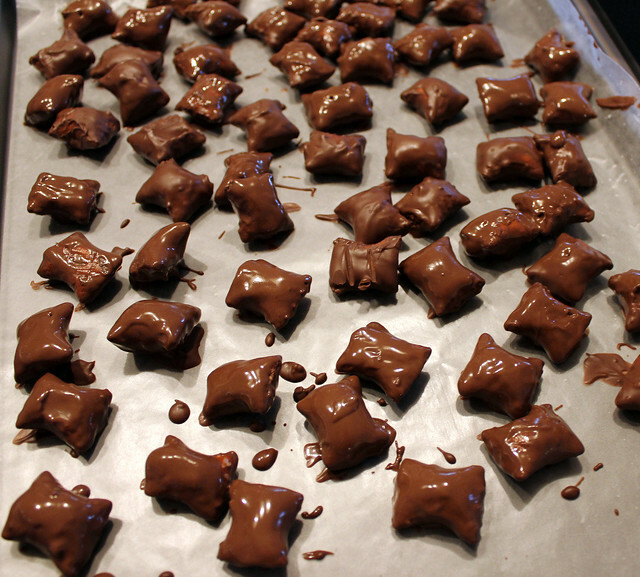 Once the chocolate melted I threw in a handful of the pretzels and rolled them around until they were coated. I fished them out with a fork and let them harden on waxed paper. You can see in the first picture that I started out using a wire rack. That really did not work out because they stuck to the rack. Waxed paper is the way to go. Wine is optional, but recommended. We used the great outdoors to finish the chilling/hardening process. Make sure they are completely hardened before putting them in a bag or container. I think these are going to be a new holiday tradition. They were so easy and delicious. 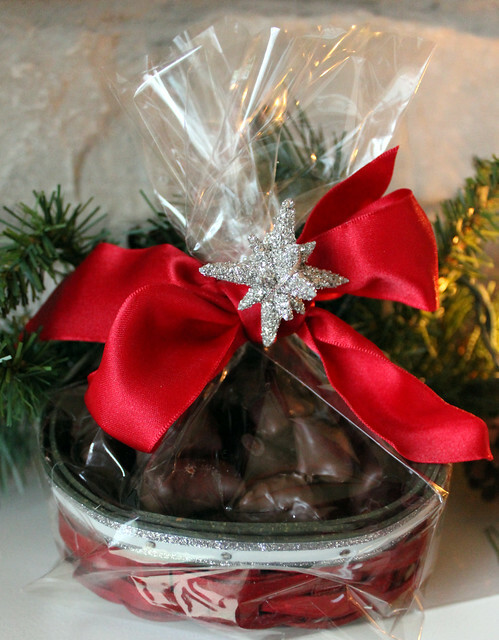 They are the perfect thing to add to a cute little basket or dish to give as a gift! I just bought some peanut butter pretzels today at Costco. BUT dipping them in chocolate? Wow, sounds terrific. Thanks!